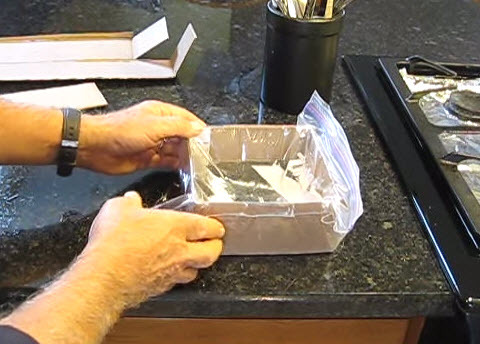 Make a water or food bowl that can easily fold for travel! Get a large sealable plastic bag. Measure the bag and cut four matching strips of cardboard to fit the dimensions of the bag. Tape the edges of the four pieces together standing upright to create a square. Open the cardboard square, put it inside the bag, push the bag down into the bowl area to remove air, then seal the bag and pour some water into the bowl area.